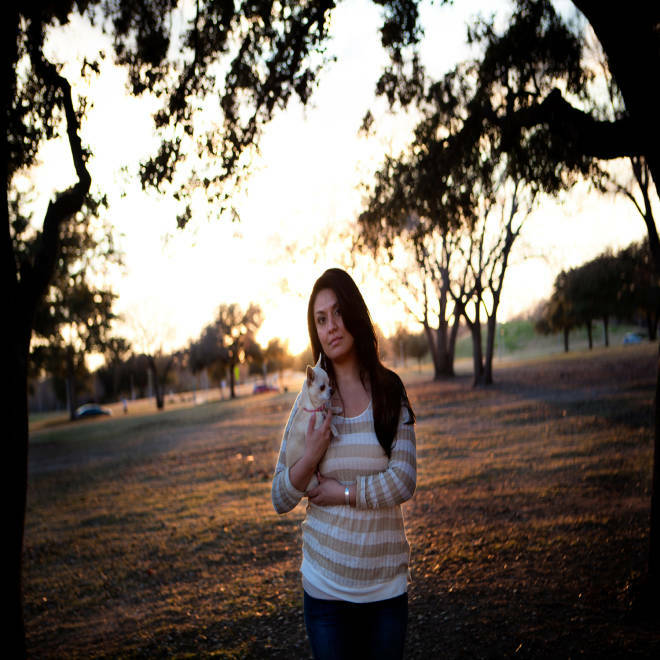 Monica Velez, pictured in Austin, Texas, had two brothers, Jose "Freddy" Velez and Andrew Velez, both of whom served the U.S. military and both are now dead -- Freddy was killed in action in Iraq, and Andrew took his own life. "When you know that you are the anchor — and if you go down, the family's going down — the problem is that you can only do that for so long," said Kristina Kaufmann. 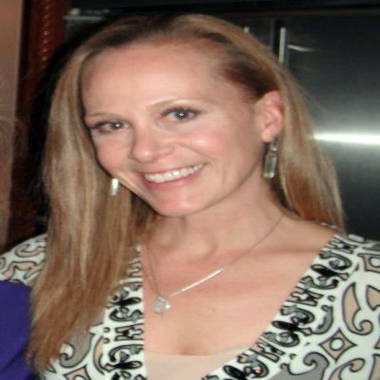 One was Faye Vick, described by Kaufmann as “the perfect picture of an Army wife — pretty, nice, always with a smile.” Vick and her family lived around the corner from Kaufmann and near Fort Bragg, N.C. In 2006, when Kaufmann’s husband was in Afghanistan and Vick’s husband was deployed overseas, the 39-year-old mother placed herself, her infant and her 2-year-old son in a car inside a closed garage and started the engine, asphyxiating all three with carbon monoxide, according to Kaufmann and to local news reports at the time. “And I know of too many others through the grapevine,” said Kaufmann, executive director of Code of Support, an Alexandria, Va.-based nonprofit that seeks to bridge the gap between civilians and military America. On Jan. 14, Department of Defense officials acknowledged that during 2012, service members committed suicide at a record pace as more than 349 people took their own lives across the four branches. The military suicide rate is slightly lower than that of the general public. However, one active-duty member died by suicide every 25 hours last year. The Army sustained the heaviest branch toll at 182 suicides, which — as NBC News reported Jan. 3 — meant that soldier suicides outpaced combat deaths for the first time, according to Pentagon officials. Defense Secretary Leon Panetta informed Congress last July that American armed forces are in the grip of a suicide "epidemic." One of the darkest undercurrents of the glaring statistics is that one suicide in a family boosts future suicide risks for everyone else inside the home. They can be contagious, say experts like Dr. Barbara Van Dahlen, a psychologist in the Washington, D.C., area and the founder of Give an Hour, which develops networks of mental-health volunteers who respond to both acute and chronic situations. Numerous researchers have explored the so-called contagion effect of suicides within families and “there’s no question the data supports there’s at least a doubling of risk,” among surviving family members, said Dr. Alan L. Berman, Ph.D., executive director of the American Association of Suicidology. The organization strives to better understand and prevent suicide. “It’s understood that risk, in part, is biological," Berman said, given that disorders like depression have a genetic component. Added Van Dahlen: "The closer that family member is to you, the greater risk you’re at. We believe, psychologically, it opens the possibility and ends a taboo." “The thousands of service members who have killed themselves,” she added, “they leave in their wake thousands of family members who are now at risk for that same kind of decision." The cascade of Velez family tragedies began with pure valor. On Nov. 13, 2004, Army Cpl. Jose “Freddy” Velez, 23, sprayed bullets at insurgent forces — covering fire to allow other U.S. soldiers time to retreat from an enemy strong point in Fallujah, Iraq. After his ammo ran dry, Freddy Velez was shot and killed. The Army awarded him the Bronze Star and Silver Star. "There are days I'm still overwhelmed. And if I sit and think about it, I feel like I wouldn't have to live through all this pain if I just let myself go," said Monica Velez, who shared family photos of brothers Freddy and Andrew. Andrew, then serving with another unit in Iraq, told Monica of escorting his brother’s body home to Lubbock, Texas — a job, he said, that required unzipping his brother’s body bag at every stop to re-verify Freddy’s identity. During the trip, Andrew called his sister repeatedly while en route home and screamed into the phone for nearly two consecutive hours, “like somebody was killing him,” she said. She doesn’t know how close she came to death the first time she tried to end her life. She never was told how slow her pulse became that night. She just remembers regaining consciousness at a hospital in Killeen, Texas — home to Fort Hood, where Freddy was based. She awoke with an IV plugged into her arm. A doctor handed her a list of local psychiatrists then discharged her. Velez tried, she said, to seek help for her deepening depression but was told that her health insurance would not cover counseling. Her grief was rooted in a difficult childhood, she said, that forged "tighter than tight" emotional bonds between Velez and her two brothers, turning the siblings into a mutual support group. “When Freddy passed away, I went through a really hard depression,” she said. “I went to the emergency room for anxiety attacks. I couldn’t breathe. But nobody knew how to deal with me so they just gave me Ativan (an anti-anxiety drug) and Hydrocodone (a pain killer). From March through July of 2006, the two swapped calls and emails. In Afghanistan, Andrew grew increasingly despondent, she said, over the unraveling of his marriage and family in Lubbock. He had three children. But he worried, too, about his sister’s state of mind. He did. Andrew’s suicide on July 25, 2006, drove Monica, at first, into 20-hour workdays at a domestic violence shelter. She wasn’t sleeping or eating. Eventually, she was drinking again, “from the morning until I passed out,” she said. “Then, doing it again the next day. “I completely lost myself. I resigned my job. I stopped paying my bills. I got evicted. I was prescribed anti-depressants. I noticed taking the pills and drinking got me out of the emotions. So I found myself in a dangerous place very quickly. 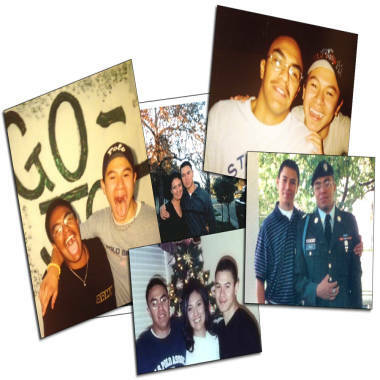 In 2008, a friend at Fort Hood, Texas, connected Velez with the Tragedy Assistance Program For Survivors (TAPS), a resource for anyone who suffers the loss of a military loved one. “That was the first time anybody had offered to help me with the depression and the grief.” she said. Kaufmann, who lost three Army-spouse friends to suicide, argues that military-family suicides should be tracked and researched by the Department of Defense to help mental-health experts begin to slow or stop the problem. She knows, however, such an accounting is not likely. “I get the sense that people in the military think that by including families into this kind of discussion — particularly when you’re talking about the (broader) mental-health impacts on family members — they look at that as something that will only add to the problem. Whereas, we believe that it would prove to be a solution,” Kauffman said. “We’ve approached this very myopically. More than half of soldiers are married. Soldiers come with families. And the military has a maddening way of both dismissing families and holding them accountable at the same time. It’s frustrating for us, not only when we’re trying to get our husbands help, but also when you have the family units breaking down,” she added. NBC News requested to speak with officials at the newly formed Department of Defense suicide-prevention office about the issue of suicides within military families and whether tracking is needed. A DOD spokeswoman said, however, that the office is only working to address active-duty suicides. The interview request was not granted. Van Dahlen, meanwhile, believes that asking DOD to track military families is an unreasonable expectation to place on the agency when it already is facing budget cuts. Even if the DOD wants to — and many of my colleagues there desperately would want to devote resources to this — those resources are not going to be there,” she said. Rather than putting "the screws to DOD" and doing "even more with even less," Van Dahlen believes public-private partnerships should be encouraged "to figure out how we can (address) this together." More than eight years after Freddy’s combat death, and more than six years removed from Andrew’s suicide, Monica Velez annually runs the Marine Corps Marathon in Washington, D.C., in honor of her fallen brothers. 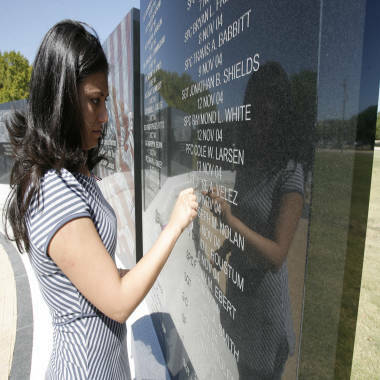 Monica Velez cleans her brother's name, engraved in a memorial at Fort Hood, Texas. “There are days I’m still overwhelmed. And if I sit and think about it, I feel like I wouldn’t have to live through all this pain if I just let myself go. It doesn’t just go away. But you learn how to cope. You learn better coping skills,” she said, adding she gained those tools from TAPS. Army officers at Fort Hood have occasionally asked her, she said, for ideas to help them prevent the rising military suicide rate. She watches that tally, too. “The numbers take my breath away. I know it can be overwhelming for the Army generals on the other end of the table trying to figure this problem out. Because it’s like an airborne disease going through the building and you’re trying to figure out how to stop it before it gets to you," she said.